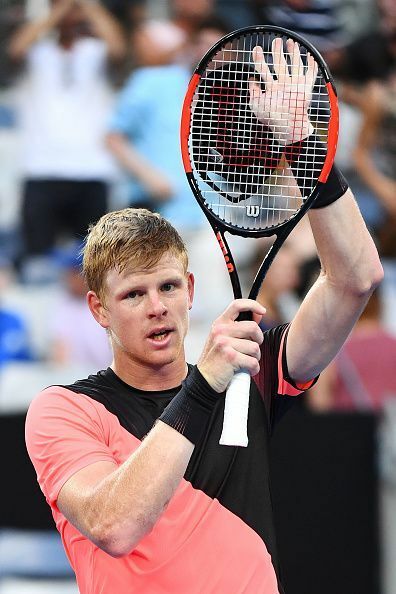 Kyle Edmund is a British tennis player who is considered one of the brightest young prospects in the game right now. He is known for his explosive game which is highlighted by his big forehand, and on his day he can match the power of any player in the world. Although Edmund is a tad older than the likes of Alexander Zverev and Hyeon Chung, he announced himself on the global stage at around the same time as them. He has had comparably strong results at the big events so far, and has attracted plenty of attention from the British media in particular. Edmund is an aggressive player who likes to take the ball on. While he is primarily a baseliner, he makes frequent trips to the net in order to finish points. Edmund uses his serve to set up his forehand, which he hits crosscourt and down the line with equal confidence. The Brit's go-to strategy is to pound the ball into the corners with his groundstrokes and push his opponent behind the baseline, eventually finishing with a winner. Edmund's biggest asset is clearly his forehand, which is relentless in its power and consistency. Edmund can take charge of any rally by unloading on his forehand, and most opponents try to avoid hitting to that wing. Edmund has a good serve which enables him to hold comfortably on most occasions. While he doesn't always win a lot of free points with his serve, he uses it to set up plenty of easy putaways for his forehand. Edmund's backhand is his weaker wing, but he can hold his own with it against most players. His movement, however, is always a little suspect; defense is not his strongest suit. Edmund was born in Johannesburg to South African parents, but the whole family moved to the village of Tickton (England) in 1998. As a kid Edmund played both cricket and tennis, but shifted his full focus to the latter at the age of 10. He trained at a couple of academies in Hull and Berkshire before settling down in Roehampton to work with coach Colin Beecher. Edmund now lives in the Bahamas, where he enjoys warmer climate and also benefits from tax breaks. Edmund is considered Britain's best hope for tennis success once Andy Murray retires, and that has put a lot of pressure on his young shoulders. But he has dealt with it admirably, shutting out all the distractions to concentrate on what he does best: play tennis. Edmund's work ethic has earned him praise from most observers. If he continues working on his game, he is likely to become a legitimate threat at the Slams in the coming years.